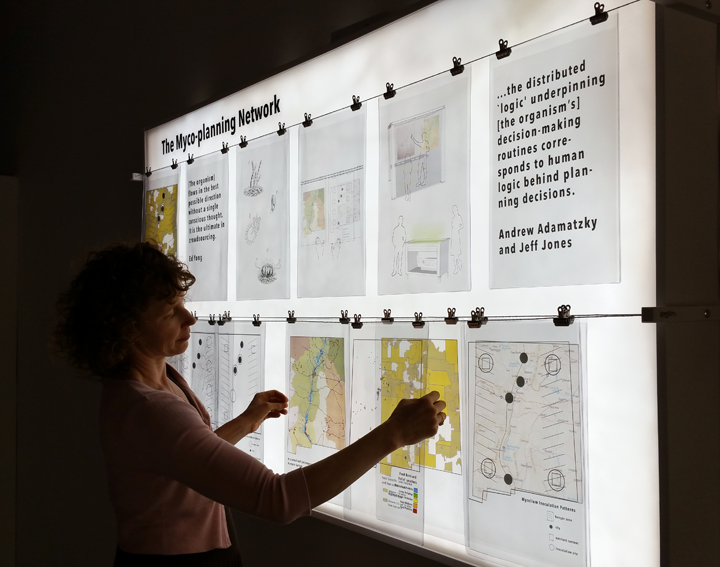 Myco-planning Network is a collaborative data visualization, art, and citizen science exhibit that currently focuses on the topic of hunger, and the networks and systems that both create and seek to solve one of our thorniest problems. Begun in the summer of 2015 by Stephanie Rothenberg and Amy Pilling, Myco-planning Network will be shaped by a team of advisors in the financial, mycology, social service, social justice, agriculture and other communities. 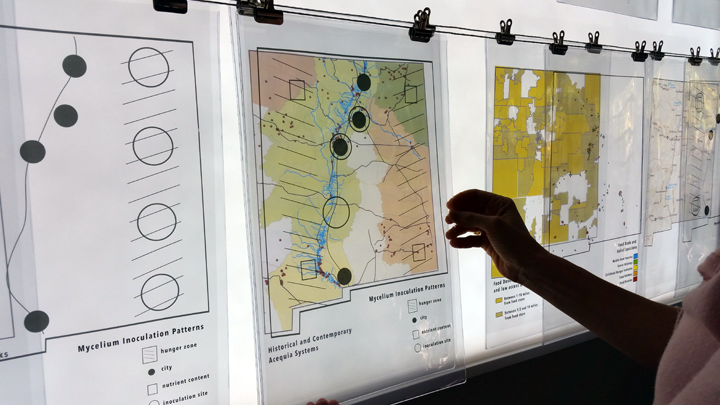 The exhibit will be performative with community interaction so that the Network can be used as a springboard to rethink system design applied to real world problems. 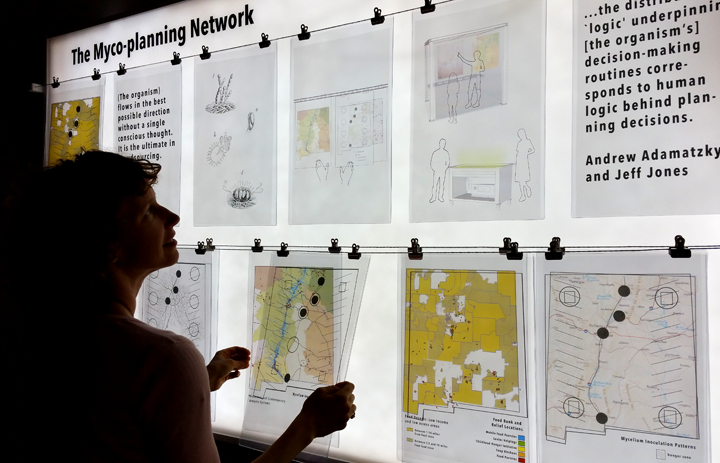 Myco-planning Network, a work in progress, was in The Land Mark Show at Muñoz Waxman Gallery, Center for Contemporary Arts, Santa Fe, New Mexico from October – December 2015. Myco-planning Network compares human-built and organism-built networks to discover anomalies or inefficiencies in human social and structural design. The end goal is to see how biologically-generated networks inform the design of human-built networks. In a mycology lab at University of New Mexico, we are growing mycelium, or ‘mushroom roots’, in agar overlayed with various patterns of nutrients and mycelium inoculant. The pattern templates correlate to live data and maps. 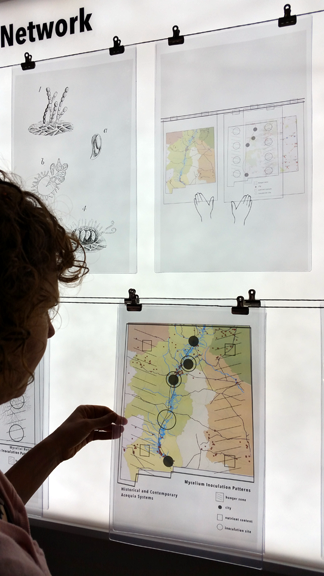 Photographic transparencies of the mycelial network patterns overlayed with mapping and other data will enable us to see what can be learned from biologically-generated networks, to reimagine systems and networks from a new perspective, and may inform network design, policy or processes. Myco-planning Network was selected as a finalist and received an award in The Land Mark Show put together by Guest Juror Grace Kook-Anderson, former Curator of Contemporary Art at the Laguna Art Museum.